Albert L. Gebelin, Captain, born April 4, 1912, Fort Barrancas, FL. Enlisted in the USN in June 1929 with boot camp at Newport, RI. He entered the USN Academy in June 1930, graduated in 1934 and reported aboard the USS West Virginia. Rotated as a JO through deck and engineering divisions with last assignment as 3rd Div. and Turret Three Officer. Ship flew "Meat Ball," the Battle Efficiency Pennant. Coached boxing team which helped win "Iron Man" for ship. Created and drew comic sailor "Chain Locker Charlie" for "Mountaineer"
Detached in 1938 for Pacific destroyer duty. On Dec. 7, 1941, he was in USS Maury (DD-401) escorting Enterprise back to Pearl and arrived in port on December 8. Continued escorting Enterprise during the early raids on Gilberts, Marshalls, Wake and Marcus, Battle of Midway and Guadalcanal. Later went to destroyers in Atlantic on convoy duty. 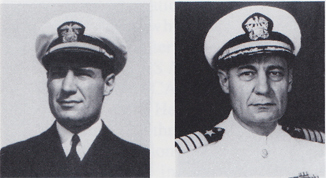 He had command of USS Thompson (DD-627) in assault on Omaha Beach at Normandy on June 6, 1944. On D-Day plus 6, transported Adm. King, Gens. Marshal, Arnold and Eisenhower from Portsmouth, England to Utah Beachhead, and again Gen. Eisenhower on D+12. After 40 days at Normandy, shifted to invasion of Southern France. Following duty as XO USNAD Crane, IN, as XO USS Mt. McKinley, and USS St Paul as COMDES Div. 52 in 1952-53 in Korea (Wonsan Harbor). COS COM-CRU DIV 3, USN War College, CO USS Kawishiwi, Ops oficer COMSERV PAC, and as COMSERVRON ONE. In June 1962, while serving as COM FLEET TRA Group, San Diego, was placed on the temporary disability retired list and retired in June 1965. His awards include the Silver Star, Bronze Star w/Combat V, Presidential Unit Citation, French Croix de Guerre w/Silver Star, Korean Presidential Unit Citation and the various area, occupation and service medals. Gebelin and his wife Betty (who with their daughter witnessed the attack on Pearl Harbor from their house on the Pearl City Penninsula and who "followed the fleet" during the war) now live in Morro Bay, CA. They have one daughter, Virginia; two grandsons and two great-granddaughters. Virginia, so named after the Wee Vee lives with her family in Texas. Albert Gebelin passed away in February 2003.